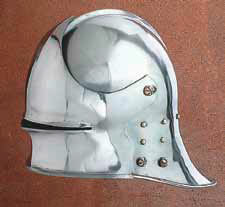 Thought to have emerged in France or Burgandy, the Sallet was the replacement for the bascinet. This helmet provided a close fit and included an extension at the back of the head, making a pointed tail at the neck for superior protection. Featuring a moveable visor, forged 16 gauge steel, a chin strap, and leather suspension liner. This page was last modified on 4 May 2014, at 17:46.